Chau, P.H. and Woo, J. 2015. The trends in excess mortality in winter vs. summer in a sub-tropical city and its association with extreme climate conditions. PLoS ONE 10: e0126774. doi:10.1371/journal.pone.0126774. Setting the stage for their study, Chau and Woo (2015) note there is a growing concern about the potential impacts of global warming on human mortality, where some researchers estimate future increases in heat-related deaths will outnumber future decreases in cold-related deaths. 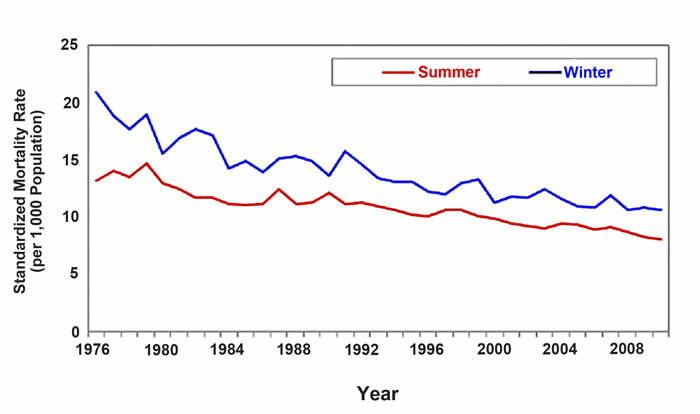 In a test of this hypothesis, the two Chinese scientists examined summer (June-August) versus winter (December-February) excess mortality trends among the older population (65 years and older) of Hong Kong citizens over the 35-year period 1976-2010. This was accomplished through the performance of statistical analyses that searched for relationships between various measures of extreme meteorological data and recorded deaths due to cardiovascular and respiratory-related causes. So what did they find? With respect to the weather, Chau and Woo report there was an average rise in mean temperature of "0.15°C per decade in 1947-2013 and an increase of 0.20°C per decade in 1984-2013." They also note that over the 35-year period of their analysis "winter became less stressful" with fewer extreme cold-spells. Summers, on the other hand, became "more stressful as the number of Hot Nights in summer increased by 0.3 days per year and the number of summer days with very high humidity (daily relative humidity over 93%) increased by 0.1 days per year." Given such observations it would be expected-under global warming theory-that cold-related deaths should have declined and heat-related deaths should have increased across the length of the record. So did they? As shown in the figure below, cold-related death rates did indeed decline (by 49.3%), from approximately 21 deaths per 1,000 persons in 1976 to 10.6 deaths per 1,000 in 2010. Heat-related death rates, however, did not increase. Rather, they too declined, from 13.2 in 1976 to 8.10 in 2010 (a decrease of 38.8%). Thus, despite an average rise in mean temperature of approximately 0.20°C per decade, and counter to global warming theory, both cold- and heat-related death rates declined over the 35-year period of study, which finding lead the two authors of this study to conclude "Hong Kong has not observed an increase in heat-related deaths as predicted in the Western literature." And that is great news for the elderly population of this famed city who have little to fear about alarmist projections of the future health-related impacts of global warming. Summer (red line) and winter (blue line) age-standardized mortality rate (per 1,000 population) for adults age 65 and older in Hong Kong over the period 1976-2010. Adapted from Chau and Woo (2015).